For the last two months I have been consumed by changing residences. First, we decided to buy a place in Madison, Wisconsin to replace our winter residence in Savannah, GA. Closing was scheduled for the end of December. In December my mother chose to show her enthusiasm for my plan to live closer to her by falling and breaking her hip. Surgery repaired the break, and before Christmas, she moved to a rehab facility. Jan and I drove to Madison to spend Christmas with Mom, leaving earlier than we had anticipated in order to avoid snow storms pummeling the Midwest. It was the first time in years Mom had her three children together with her for Christmas. The purchase of our place in Madison occurred on time, but not without drama. I’ve put that trauma behind me and won’t reopen the scabs. We camped out at our place in Madison, sleeping on a blow-up bed, long enough to bring in the New Year with Mom. Then we returned to Savannah. By mid-January, it became clear that Mom’s rehab was not going to progress sufficiently to allow her to walk again, which meant we’d have to move her from her very nice Assisted Living apartment into a Nursing Home. My sisters found the right place for her. I came back to Madison to do the heavy lifting—literally: moving from her apartment to her new room her favorite recliner, clothes, toiletries, etc. I brought the remaining pictures, mementoes, and books to store in my recently-acquired basement. Everything else I schlepped to various charities to find new appreciative owners. 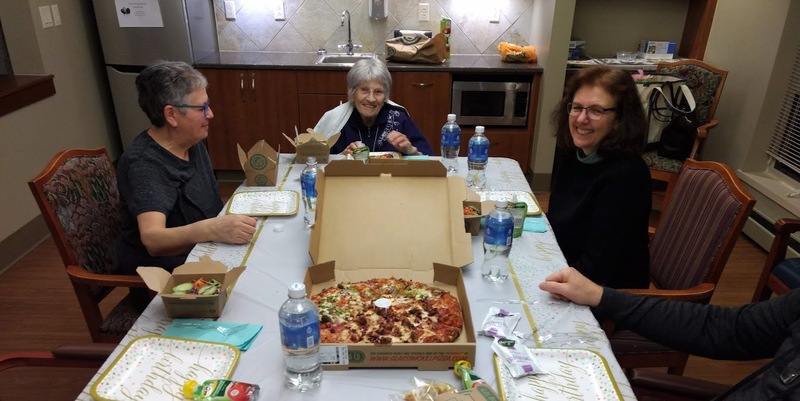 Mom’s 95th birthday was January 31st, so I remained in the area for the celebration (we had a pizza party) with my sisters and then headed back to Savannah. My first task there was to help select a mover to get our stuff from Savannah to Madison. We’ll let them pack the fragile stuff, but we’re packing everything else. But first, we went through our possessions to determine what wouldn’t go with us, donating the excess to charities if there was value, filling trash cans where there was none. Today is packing day; Tuesday they load the truck. We’re getting low on rations in the house. Wednesday night was our last “traditional” meal. Later meals become a feast of leftovers. No more grocery shopping unless it’s something vitally important. On Tuesday, Jan announced her grocery list: Wine and bread. Both met the vitally important criterium. “Aha,” I said, recalling a long-forgotten lesson from high school. “A jug of wine, a loaf of bread, and thou.” I stopped, puzzled. “There’s something else about a wilderness in there, too.” Google came to my rescue. Yep, that about sums it up: Jan and I are off to our next adventure in living, singing our fool heads off. At least we have the wine and bread.